Fishing continues to be all over the scale with a decent day once again followed by a tough day out on the water. The Sailfish we are seeing continue to be in water within two miles of shore and a trip outside of that will pretty much cut them and most others out of the picture. There are some Skipjacks out there but again the majority of the Mahi and other species we and other boats are managing are inside of that two miles. So as you look up and down the reef most everyone is inside the edge as far as you can see and putting their best stuff into the mix and looking for the opportunity at some fish. It’s a little bit broke right now and wandering off into the wild blue yonder won’t fix it. So inside is where the odds are best for you to find them but on some days you really have to pound the pavement so to speak to try and get the shots. Boats running way off to try the Swords and seeing a lot of empty water. Staying close has proven worth the strategy as there have been numerous occasions of Sails, Mahi, Bonito and Blackfins blasting Ballyhoo schools and mostly with a half mile of the beach. So if you like to wander wander to the north or south and not so much to the east and be ready for when you may (or may not) get that opportunity. A live Ballyhoo has been the best bait to fish on most days whether on the bait showers or on the prowl. Prowling has produced a couple of Wahoo and again within a mile and a half of the beach. 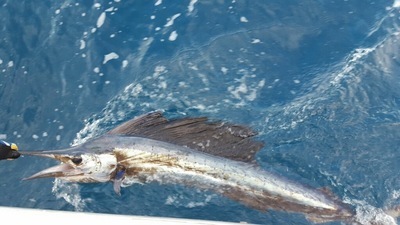 We fished offshore out in 900 the other day on an edge right out of a magazine with swirling eddies, weeds and debris. Everybody got all excited and ready for nothing. And it looked so inviting as to be almost beyond perfect. We tried both sides. Three foot seas on the inside, four to six on the outside. The strong current side and then the slower side. Right on top of it and then ranging up to 500 yards off of it inside and outside of it with surface and deep lines. Sometimes things can look so right….. The water has been good essentially every day right in close with a least a slight current and a clean clear green to a strong blue. Scattered weeds and current edges most every day. We have had some decent fish as you can see and a steady bright spot continues to be the Golden Tilefish which we target on the bottom in water from 650 to 750 feet here. As we have caught these Tilefish off the bottom we have also often soaked the live baits and have had no luck out there and trollers and live baiters beyond there have had little to no success except with an occasional Skippy. So slugging it out inside remains a prudent choice and there are fish to be had there, just some days they will really try your patience. Some wind in the forecast so we’ll see what that brings our way.